Your OptiShot Product Key uniquely identifies your copy of the application. 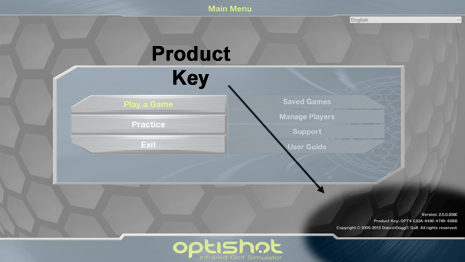 You need your Product Key in order to Register OptiShot. Printed on the Setup Instructions found inside of the DVD case. On a sticker adhered to the CD sleeve. It may also be found on a sticker on the underside of the Swing Pad. Displayed in the bottom right corner of the Main Menu screen inside of OptiShot. The Product Key will be in the form OPT6-1234-5678-90AB-CDEF.